Ancestry has added the UK Merchant Seamen's Deaths, 1939–1953 collection to its database. This record-set holds the details of more than 50,000 merchant seamen who lost their lives during and just after WWII; some 1,050 of the records relate to men born in Ireland. Harold Austin, a 52 year old Radio Officer, was lost overboard from the SS Brazilian Prince on 15 Nov 1951. He was born in Johnstown (Co Kilkenny) but had settled in Durham. 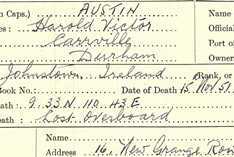 His unnamed next of kin lived at New Grange Road, Durham. His place of death note the ship's co-ordinates when he was lost (see image, right). Cornelius William McCarthy, a 42-year-old 1st Radio Officer living in Ilford, Essex, died on the SS Chama on 23 March 1941. The file reports him as 'Missing supposed drowned following enemy action having been torpedoed and presumed sunk'. He was born in Killarney, and his medals were sent to his sister in Knockeenalicka, Kilcummin, Killarney. Thomas FitzGerald was a 17-year-old Assistant Cook from Thomastown, County Kilkenny. He was reported as 'Missing presumed drowned (enemy action)' on 10 April 1942 from the SS Empire Prairie. His next of kin was his mother, Elizabeth.